An oval green purple and orange Murano glass centerpiece made in Italy in the 1970s. 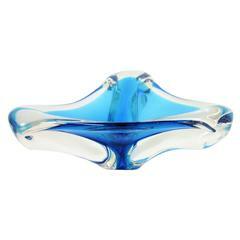 A particular Murano glass centerpiece made in Italy in the sixties, it's in perfect conditions. 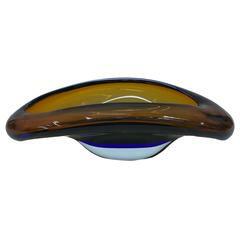 Rare Murano glass centerpiece made in Italy in the 1970s attributed to Seguso. 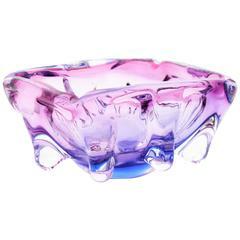 Particular Sommerso Murano glass centerpiece made in Italy in the 1960s, item is in perfect conditions. The green and brown colors are made with the Sommerso technique. Italian centerpiece made in Murano in the Seventies attributed to Seguso, in the colors of brown and blue, very heavy and in perfect conditions. 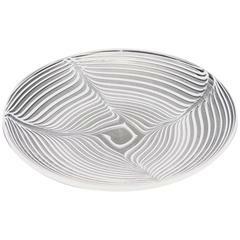 1950 Italian glass bowl or centerpiece, Mid-Century Modern, in the tradition of the great Italian manufacturer as Venini. Archimede Seguso hand blown Murano glass clam shell in pink, clear and white centerpiece with pearl. Not marked.